Print this template onto heavy paper to make a pie plate. I like to use manila folders or cardstock. 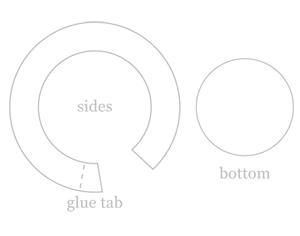 Put glue on the tab to secure the side together. This would be cute painted to look like enamelware, graniteware, stoneware or tin. To add more baking pans to your cupboard, you may wish to download the printable bread pan. Please share what you come up with! For the best print quality, download the pdf. That's great! Thank you for the patterns! thank you very much, Carol, this one of my favorite stores, one day I can print everything?? ha ha! Thank You Carol! These prints are so Nice! I`ll try them today!